Commutes home can be a right miserable affair. Sometimes, all that's needed is a dose of Freddie Mercury bliss. 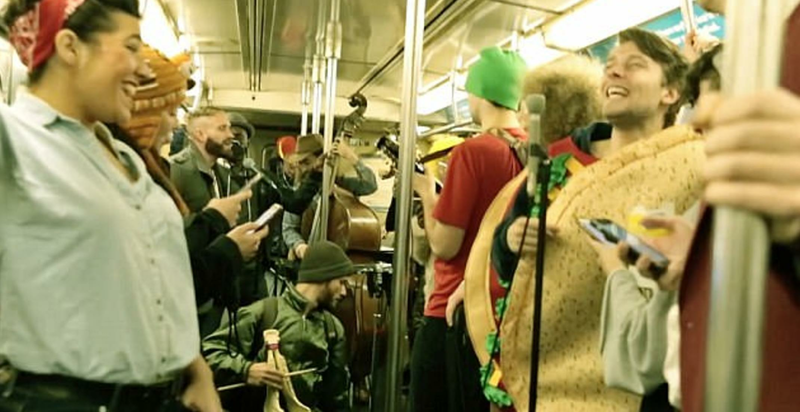 This is the moment when an entire band of 25 musicians burst into song, and played 'Somebody To Love' on a packed subway train in New York City. Members of music collective Apartment Sessions belt out the Queen anthem, much the amusement of passengers. Though, if you just wanted a quiet trip home, this probably wasn't what the doctor ordered. Shot on Halloween night, a number of the musicians also played the song while wearing outlandish costumes, including a taco and a giraffe. Luke McGinnis, one of the troupe leaders, said: "The problem remained: How do we get away with this without causing disruption and annoying everyone? "It wouldn't feel like Apartment Sessions if we were bothering people. "That's when we realized: We do it on Halloween, and dress up in silly costumes, and pass out candy. "Anyone on the subway in New York expects this kind of thing on the train on Halloween, so we figured that was the one day in the whole year that we could do it without wrecking someone's commute." Months of planning went into the performance, as they needed to arrange every single mic placement, camera angle, and instrumentation set-up. He added: "We did three takes on three trains, some more crowded than others, and each time were met with enthusiasm, incredulous looks and even singing along. "You can hear, in the end of the video, a passenger saying, 'I love New York! I've been away a long time, man, and I haven't seen something like this in a while."